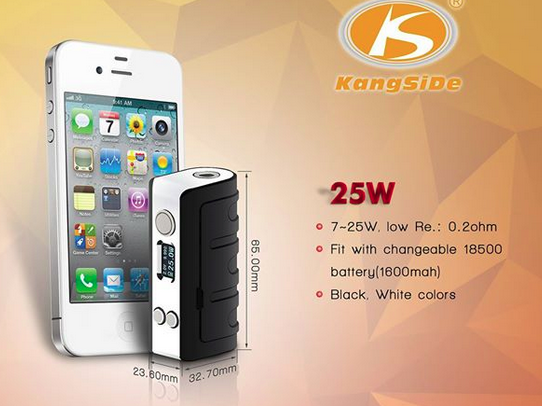 Anyone tried out the Kangside Mini 25w mod yet? Thread: Anyone tried out the Kangside Mini 25w mod yet? I haven't tried it but have looked into them for my parents. The con for me is the 1600mah built in battery. Not sure when it will be released but its something else to consider if you like the look of it. Takes 18650 and is only 80mm high without atty. Last edited by arth_d; 16-10-15 at 08:28 AM. 0.2 Ohms with only 25W to play with? Got a link to that clone looks like an interesting mod? Thanks everyone for the info, its been a while since i looked into new mods and things change so quickly. Is it worth looking into the TC option as i only vape around 8.5 w? Last edited by Convert; 16-10-15 at 11:41 AM.